1.80% APY at no minimum deposit. 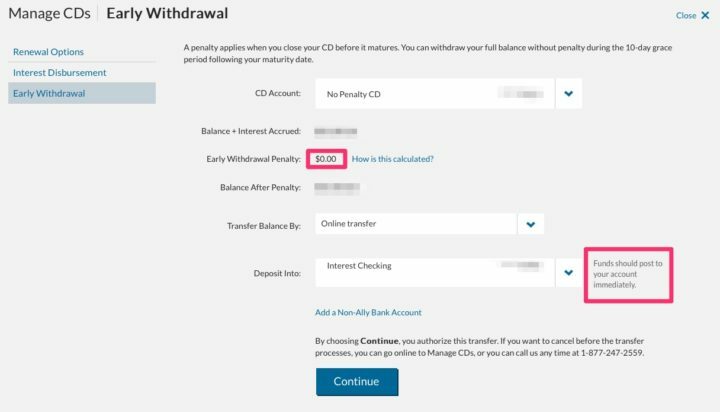 The 11-month No Penalty CD is unique in that while the rate is locked in at deposit, you can still withdraw your principal and interest without penalty at any time (well, you must wait at least 6 days from the deposit date). In other words, your interest rate can never go down, but you can still jump ship if rates rise or if there is a better promo elsewhere. For comparison, the Ally Online Savings account is currently at 2.00% APY for all balances. The interest rate on the savings account can go up or down, although in this current rising rate environment that seems unlikely. The Ally 12-month CD is at 2.65% APY, which is fixed but if you withdraw early there is a penalty of 60 days of interest. In addition, Marcus Bank has a 13-month No Penalty CD at 2.15% APY with a $500 minimum deposit. CIT Bank has a 11-Month No Penalty CD at 2.05% APY with a $1,000 minimum deposit. If you have lower balances, one of these may be a better fit. When you fund your CD within 10 days of your open date, you’ll get the best rate we offer for your term and balance tier if our rate goes up within that time. The Ally Ten Day Best Rate Guarantee also applies at renewal. If you have an existing No Penalty CD past the 10-day rate guarantee, this means you may consider closing it and then opening up a new one at a higher rate. You will have to withdraw everything at once – there are no partial withdrawals allowed on this type of CD. If you have an Ally savings or checking account, you can close the old CD, see the deposit in your savings/checking, and open up a new CD all in minutes online. (Note that savings accounts are limited to 6 withdrawals per month, so use your checking if possible.) You will be extending the term out another 11 months, but since you can always close it at any time it isn’t much of a concern. You can use my Ultimate Rate-Chaser Calculator to get an idea of how much additional interest you’d earn if you switched over. Ally is my primary “hub” bank, despite not being at the tippy-top of all rates. I like Ally because their rates are generally competitive across both savings and CD products and they offer an easy-to-use website, Live Chat customer service, easy bank account linking, and 1-day bank transfers in many cases. I then proceed to open additional bank CDs as temporary “spokes” when external rates are significantly higher. Bottom line. The Ally No Penalty CD is unique in that you are always able to move out to a higher rate, but you’ll never get a lower one. This means you can even break the No Penalty CD simply to get another No Penalty CD if/when the rate rises again. I am trying to understand this offering. Is there a reason for me not to move most of my Ally Savings account money over to several $25K CDs? I can then move them back one by one whenever I need the money? This seems to increase my interest by 50% with very little effort and no down side. Yes, it wise to put it in $25k amounts as partial withdrawals are not allowed on the No Penalty CD. If you’re alternative is the Ally online savings, then the only cost is the hassle of applying and “breaking” the CD early. Good news that applying is quite easy for existing Ally customers. I did it. Very easy, thanks for the tip. I am now earning 1.5% on most of my short-term savings / emergency fund. If it doubled your interest rate, then you must only have a Money Market Savings account. The Online Savings account currently gives you 1.80%. 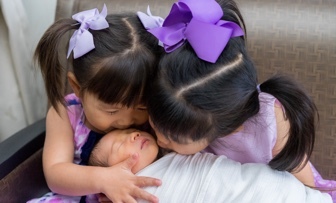 You can have both accounts, one with check writing and one without. As for 1.80% vs 2.10%, $68.75 more interest if the savings rate doesn’t rise. Yes it seems pretty easy as described, but I’m not sure it’s worth the effort. If there is no penalty, will you still receive all accrued interest at time of withdrawal? With our No Penalty CD, you will not be charged a penalty for early withdrawal. You can withdraw your full balance and interest any time after the first 6 days following the date you funded the account. Can you compare this product to, say, their current 5-yr CD offering (w/ early termination fee) which is currently at 2.25%? @Dan – The 5-yr has a 5 month early termination fee. So the break even point (to earn a round 1.5% interest accounting for the early termination fee) is 15 months. If you close it out in 11 months , you will end up with a rate of about 1.23%. I saw this yesterday on their website, closed out my current 11 month no-penalty CD which was giving me 1.25% and opened a new one right away which now gives me 1.5%. Since i am an existing Ally customer, it was a very seamless experience. I agree that the 11 month no-penalty CD is like a liquid account if you can keep a tab on it. I’m going to convert my Alley savings account (1.05%) to a handful of these right after I get my savings account interest payment on the 25th. There’s no reason to wait. Interest is accrued daily. You won’t lose anything. I just opened the CD, super easy to open and change options. Thanks! Jonathan do you think its wise to wait until after the Fed announcement this week before doing anything or do you think the likely rate increase is already baked into all the alternatives? I would say if the 0.10% makes a difference (i.e. you have a big balance) you should just go for the new 1.60% rate now and break it later if needed. That’s the benefit of no-penalty CDs. You should add in your rate chaser tool to this post. Thanks for the update on this, much appreciated (especially for those of us with the old 1.5% rate looking for the bump up). Muchas gracias! From the “Let Them Eat Cake Dept.” or is it the “Something Is Better Then Nothing Dept.” I think Ally was overwhelmed by their 2% CD offer. I was on hold 12 minutes yesterday to ask a question. Normal wait time is less then a minute. You’re right, the estimated wait time is currently 22 minutes at 10am Pacific. They also said the 2% CD rate is only good until January 2nd. I qualified for the 10 day best rate guarantee but contacted Ally as I did not see the rate increase reflected yet in my account. They stated for those qualifying, the rate increase will be reflected on the 11th day after opening the account. Fwiw, I Bonds are paying 2.58%. You can also get good returns on TIPS and T-Notes if you’re careful (their rates are determined at auction). Ally rates are just not competitive any more. PurePoint at 1.90% apr savings rate is a far better alternative than the 11-month CD, especially given that interest rates are going no where but up in near future. Does it pay lock into a 12 month 2.5% CD this week. Or would you wait to see if that rate gets a bump up from what will hopefully be a Fed rate hike tomorrow? Honestly, it’s hard to tell what rates will do. Ally was offering 2% APY 12-month CDs back in December 2017, and if you locked that in through December 2018, I think your overall return would have exceeded most online savings accounts (definitely Ally’s) since even the top ones didn’t really hit 2% until a few months ago. At the same time, I like to always keep a certain amount of funds with zero penalty access. I wonder how closing the current CD and moving into the new higher rate CD will affect the “1% bonus” payout from October promo. You have to keep the “new money” in any combination of savings, checking and CDs. So moving to a different CD should have no effect. That’s my reading of the rules. Asking Ally is best to confirm. I agree with Bill in that closing and opening a new CD should theoretically keep you qualified for the 1% bonus. In practice, I would still track things carefully, because sometimes this stuff messes with whatever software system they have tracking these deposits for their promotion, and you have to ask for it later. I just had a chat with Ally on this. Bill’s answer is correct so long as you are the owner or joint owner of the account. The agent was careful to point out that moving the money to a trust or IRA that you have with Ally would NOT count. Perhaps someone else could chat, call, or send a secure message and ask the same question just to be sure we are getting a consistent answer. I called their customer service line today, and the woman I spoke with agreed that moving my funds to a new No Penalty CD wouldn’t interfere with eligibility for the 1% bonus. She handled it all over the phone. Incidentally, the rate seems to have ticked up to 2.25%. Hmmm, I just called them and they said you have to leave the money in that same savings account to get the promo. I am confused but will be on the safe side and not move that money.